CARSON, Calif. (March 4, 2019) – Multiple-division world champion Robert Guerrero returns to the ring to battle Colombia’s Hevinson Herrera in a 10-round welterweight bout, while former featherweight world champion Jesus Cuellar duels Colombia’s Carlos Padilla in an eight-round lightweight bout to lead a packed undercard on Saturday, March 9 at Dignity Health Sports Park in Carson, California. The event is headlined by PBC on FOX and FOX Deportes show that will see WBC Welterweight World Champion Shawn Porter making his first title defense in primetime against mandatory challenger Yordenis Ugas in the main event of the broadcast beginning at 8 p.m. ET/5 p.m. PT. Televised prelims on FS1 feature undefeated bantamweight prospect Damien Vazquez battles former world champion Juan Carlos Payano in an eight or 10-round attraction, while unbeaten welterweight prospect and 2016 Lithuanian Olympian Eimantas Stanionis will face once-beaten Sammy Figueroa in an eight round showdown on the telecast beginning at 6:30 p.m. ET/3:30 p.m. PT. In other undercard action, undefeated lightweight Rolando Romero (7-0, 6 KOs) meets Nicolas A. Velazquez (10-4, 3 KOs) in a four or six-round match that will be the TV swing bout on the FOX telecast and unbeaten featherweight Isaac Avelar (15-0, 10 KOs) clashes with Juan Antonio Lopez(12-5, 4 KOs) in a six or eight-round match that will be the TV swing bout on the FS1 prelims broadcast. Tickets for the live event, which is promoted by TGB Promotions, are on sale now. Tickets can be purchased at AXS.com. The 35-year-old Guerrero (34-6-1, 19 KOs) has a rich career filled with intriguing matches against some of the best boxers of this generation – Floyd Mayweather, Jr., Keith Thurman, Danny Garcia – and has won titles at featherweight, super featherweight, lightweight and welterweight. Fighting out of Gilroy, California, he will be taking on Herrera (24-16-1, 18 KOs) following a knockout victory over Adam Mates in December. Cuellar (28-3, 21 KOs), who is from Buenos Aires, Argentina, won an interim featherweight title by defeating Claudio Marrero in 2013 that was eventually made the regular title as he made five successful defenses. He dropped the title the next year with a split decision loss to Abner Mares and followed that up with a TKO loss in a junior lightweight championship match against Gervonta Davis last April. The 33-year-old Cuellar is seeking to get back into the world title picture but first will have to get past Padilla (16-9-1, 10 KOs). In other undercard bouts unbeaten super featherweight Viktor Slavinskyi (7-0-1, 4 KOs) takes on Mexico’s Angel Morrell (11-11-2, 4 KOs) in a six-round match, super featherweight prospect Jose Perez (6-1, 2 KOs) battles Carlos Trevino (6-13-1, 1 KO) in a four-round bout, unbeaten super lightweight prospect Ruben Rodriguez (4-0, 2 KOs) meets Jeremiah De Los Santos of Brownsville, Texas, who will be making his pro debut in the four-round bout. Rounding out the action is unbeaten super lightweight prospect Justin Cardona dueling Phillip Bounds in a four-round affair, plus a pair of lightweights will be making their pro debuts as David Gomez of Huntington Park, California battles George Carranza in a four-round fight and Gabriel Muratalla of Fontana, California steps in for a four-round lightweight fight against Bryann Perez. Before pound-for-pound king Terence “Bud” Crawford enters the ring to defend his WBO welterweight world title against Amir “King” Khan, a pair of 21-year-old wunderkinds — Teofimo Lopez and Shakur Stevenson — will look to steal the show in their respective co-feature bouts on ESPN PPV Saturday, April 20 at Madison Square Garden. 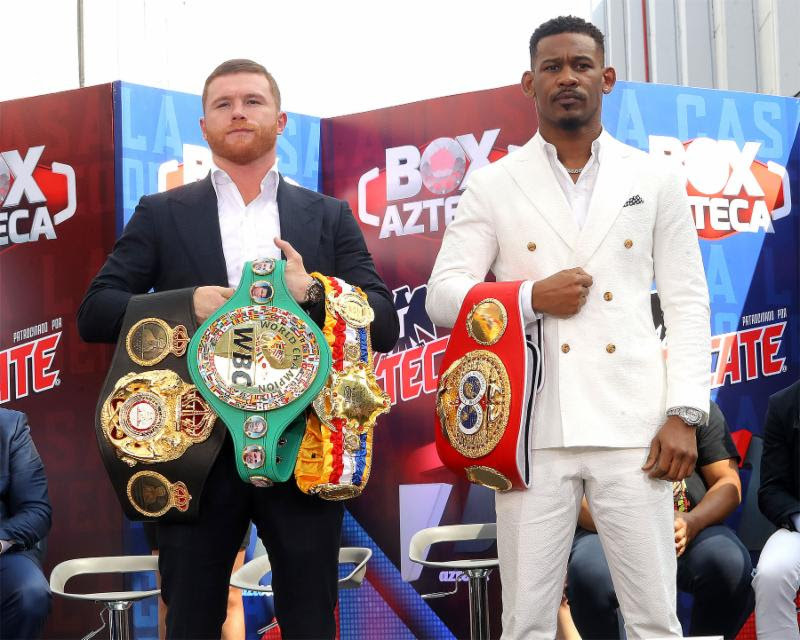 Stevenson, the 2016 U.S. Olympic silver medalist, will tangle with former 130-pound world title challenger Christopher “Pitufo” Diaz in a 10-round featherweight bout. Lopez, the consensus 2018 Prospect of the Year and top lightweight contender, will face two-time European lightweight champion and former world title challenger Edis Tatli in a 10-rounder. Tatli is ranked No. 3 by the IBF and No. 10. And, in a special attraction that will open the broadcast, Puerto Rican star Felix “El Diamante” Verdejo will fight former two-time interim super featherweight world champion Bryan Vasquez in a 10-round lightweight bout that will thrust the winner into the world title picture. Tickets priced at $606, $406, $306, $206, $106, $81, and $56 (including facility fees) are on sale now and can be purchased at the Madison Square Garden Box Office, all Ticketmaster outlets, Ticketmaster charge by phone (866-858-0008) and online atwww.ticketmaster.com and www.msg.com. Details on how fans will be able to access the pay-per-view broadcast, which will begin at 9 p.m. ET/6 p.m. PT, will be announced at a later date. The entire undercard will stream live beginning at 6 p.m. ET on ESPN+, the new multi-sport, direct-to-consumer subscription streaming service from The Walt Disney Company’s Direct-to-Consumer & International segment in conjunction with ESPN. Stevenson (10-0, 6 KOs) followed up a 5-0 campaign in 2018 with a spectacular fourth-round TKO over Jessie Cris Rosales on Jan. 18 in Verona, N.Y. A native of Newark, N.J. — a short train ride from Madison Square Garden — Stevenson hopes to move closer to a world title opportunity in front of his home fans. Diaz (24-1, 16 KOs), from Barranquitas, Puerto Rico, moved down to featherweight following his July 2018 decision loss to Masayuki Ito for the vacant WBO junior lightweight world title. He knocked out David Berna in the first round on Nov. 24 to set up the Stevenson showdown. Verdejo (24-1, 16 KOs), a former amateur superstar for his native Puerto Rico, hopes to graduate to contender status with a victory over Vasquez. He suffered his first loss last March via 10th-round stoppage to Antonio Lozada Jr. in a fight he was leading. Verdejo was victorious in his comeback bout on Nov. 10 in Puerto Rico, knocking out Yardley Armenta Cruz in the second round. Vasquez (37-3, 20 KOs) has won two in a row since a tight majority decision loss to Ray Beltran in August 2017. NEW YORK CITY (March 4, 2019) — Vladimir Nikitin and Irish sensation Michael “Mick” Conlan are on a collision course for a rematch of their quarterfinal bout from the 2016 Rio Olympics, won by Nikitin via highly controversial decision. Nikitin will fight Juan Tapia (8-2, 3 KOs) in a six-round featherweight bout on the undercard of Conlan’s 10-round featherweight tilt against Ruben Garcia Hernandez on Sunday, March 17 at Hulu Theater at Madison Square Garden. Conlan-Hernandez will be the special attraction for this special St. Patrick’s Day card, with the welterweight showdown between Luis Collazo and Samuel Vargas serving as the main event. In the newly announced co-feature, two-time Irish Olympic bronze medalist and former world title challenger Paddy Barnes (5-1, 1 KO) will look to get back in the win column against Oscar Mojica (11-5-1, 1 KO) in a six-rounder at bantamweight. Barnes challenged Cristofer Rosales for the WBC flyweight world title last August and lost via fourth-round knockout. Promoted by Top Rank, tickets priced at $206, $156, $106, $81, $56, and $31 (including facility fees) are on sale now and can be purchased at the Madison Square Garden Box Office, all Ticketmaster outlets, Ticketmaster charge by phone (866-858-0008), and online at ticketmaster.com and MSG.com. Conlan-Hernandez, Barnes-Mojica and Collazo-Vargas will stream live and exclusively at 6 p.m. ET on ESPN+, the direct-to-consumer sports streaming service from The Walt Disney Company’s Direct-to-Consumer & International segment and ESPN. The entire undercard, including Nikitin-Tapia, will stream live on ESPN+ beginning at 3 p.m. ET. Nikitin (2-0, 0 KOs) was a standout amateur for his native Russia who won medals at the European Championships and World Championships. At the 2016 Rio Olympics, his disputed decision over Conlan advanced him to the medal round and made headlines around the globe. Conlan’s double middle-finger salute to the AIBA-appointed judges became the indelible image of the Rio Olympics. As a pro, Nikitin has won a pair of dominant six-round decisions and hopes another victory sets the stage for the long-awaited rematch. Joseph “Blessed Hands” Adorno (11-0, 10 KOs), the 19-year-old power punching prodigy, will face the durable Victor Rosas (10-8, 4 KOs) in a six-rounder at lightweight. Adorno has seven first-round stoppages on his ledger. Bronx native Josue “The Prodigy” Vargas (12-1, 8 KOs) will take on Adriano Ramirez (10-2, 6 KOs) in an eight-round super lightweight bout. Vargas has won six in a row since a controversial disqualification loss. Puerto Rican super lightweight prospect John “El Terrible” Bauza (11-0, 5 KOs) will make his Top Rank debut against Ricardo Maldonado (8-8-1, 1 KO) in a six-rounder. Lee Reeves (2-0, 2 KOs), a two-time Irish national champion as an amateur, will continue his professional journey against Eduardo Torres (1-1, 0 KOs) in a four-round welterweight fight. BROOKLYN (March 3, 2019) – Former 154-pound world champion Erislandy Lara and WBA Super Welterweight Champion Brian Castaño fought to a highly competitive split-draw Saturday at Barclays Center, the home of BROOKLYN BOXING™, in an event presented by Premier Boxing Champions. With the draw, Castaño retains the WBA belt in what was the toughest test of his career against the longtime top 154-pounder in Lara. The judges scored the fight 115-113 (Castaño), 115-113 (Lara) and 114-114. In SHOWTIME CHAMPIONSHIP BOXING COUNTDOWN action that streamed live on the SHOWTIME Sports YouTube channel and SHOWTIME Boxing Facebook page, Edwin Rodriguez(31-2, 20 KOs) won a 10-round cruiserweight fight via unanimous decision over Mitch Williams (16-7-3, 11 KOs) by scores of 96-94 twice and 98-92. Coverage on social media also sawAntonio Russell (13-0, 11 KOs), younger brother of WBC Featherweight Champion Gary Russell Jr., stop Jose Maria Cardenas (16-4, 13 KOs) 22 seconds into the sixth round of their bantamweight fight. In the opening bout of the digital presentation, Leduan Barthelemy (14-0-1, 7 KOs) remained unbeaten with a unanimous decision over Miguel Angel Aispuro (11-7-2, 7 KOs) by scores of 80-72 twice and 79-73 in their eight-round super featherweight attraction. LAS VEGAS and CHICAGO – UFC®, the world’s premier mixed martial arts organization, and two Kraft Heinz Company brands, Oscar Mayer P3 and DEVOUR, today announced a comprehensive multi-year partnership that expands on the innovative marketing relationship the companies began last year. The DEVOUR™ frozen food brand has been named “Official Frozen Meal of UFC,” joiningOscar Mayer P3 Portable Protein Pack, which was named “Official Protein Snack” of UFC in 2018. Both designations are new and mark exclusive sponsorship categories for UFC. DEVOUR™ launched in 2016 with the mission to shake up the frozen aisle by taking an unapologetic stand for mouthwatering, craveable frozen foods. Over the past 3 years, DEVOUR™ has successfully built awareness with its bold and disruptive approach to communications, which has fueled its rapid growth in popularity with consumers. The brand offers frozen meals, frozen sandwiches, and instant bowls, which are widely distributed in retail grocery and convenience stores across the country. Similar to Oscar Mayer P3’s strategic partnership with UFC, DEVOUR’s™ collaboration with UFC will focus on reaching the loyal MMA fan base that comprises key demographics, including millennials, early adopters, and trendsetters. Under the terms of the expanded partnership, both Oscar Mayer P3 and DEVOUR™will be integrated extensively into select UFC live events, highlighted by a branded presence inside the world-famous Octagon®; custom integrations throughout UFC’s telecasts; in-venue activations; unique social media campaigns; custom content pieces, and Fight Week and Fight Night integrations. In 2019, both Oscar Mayer P3 and DEVOUR™ will launch dedicated UFC products at select participating retail locations across the country. An exclusive Oscar Mayer P3 product line will feature co-developed product nutritionals focused on workout performance, certified by the UFC Performance Institute®, along with the integration of UFC-themed packaging. DEVOUR™ will also leverage UFC marks on various product offerings. In addition, the Oscar Mayer P3 and DEVOUR™ brands will be further integrated with UFC through dedicated custom content pieces. Oscar Mayer P3 will leverage UFC fighter talent within an original series produced at the UFC Performance Institute in Las Vegas, highlighting the importance of protein in an athlete’s preparation and daily routine. DEVOUR™ will integrate into Dana White: Lookin’ for a Fight program, featuring unique DEVOUR™ marketing placements and mentions. The expanded partnership will begin on Saturday, March 2, with UFC® 235: JONES vs. SMITH, featuring two highly anticipated world championship fights. Light heavyweight champion Jon Jones wastes no time getting back in the Octagon as he takes on dangerous finisher and No. 3-ranked contender Anthony Smith. Also, welterweight champion Tyron Woodley goes for his fifth consecutive title defense against No. 2-ranked contender Kamaru Usman. Luego de deslumbrar al público de la Gran Manzana con sus últimos tres combates, Vasiliy “Loma” Lomachenko está listo para traer sus títulos mundiales de peso ligero a la Ciudad de los Ángeles. Lomachenko, el Picaasso libra por libra del boxeo, y monarca peso ligero de la Organización Mundial de Boxeo (OMB) y Asociación Mundial de Boxeo (AMB), defenderá sus títulos ante el ex campeón mundial de peso ligero Anthony “Million Dollar” Crolla el viernes 12 de abril en el Staples Center. En el choque co-estelar, el invicto campeón mexicano y largo rey de peso súpermediano de la OMB, Gilberto “Zurdo” Ramírez, hará su debut en el peso semipesado en un combate a 10 asaltos contra un oponente que se anunciará pronto. El combate Lomachenko vs. Crolla y la pelea de Ramírez se transmitirá en vivo y exclusivamente en los Estados Unidos a partir de las 11 p.m. ET / 8 p.m. PT por ESPN+ – el servicio de transmisión de suscripción directa al consumidor, que marcará su primer aniversario desde el lanzamiento el día de la pelea. La cartelera completa también se transmitirá en vivo por ESPN+ a partir de las 8 p.m. ET / 5 p.m. PT En una promoción de Top Rank, en asociación con Matchroom Boxing USA, los boletos con un precio de $310.50, $207, $103.50, $77.65 y $51.75 (incluidas las tarifas de las instalaciones) saldrán a la venta mañana martes 26 de febrero a las 12 p.m. PT. La última aparición de Lomachenko en Los Angeles fue en agosto del 2017 en el Microsoft Theatre cuando defendió su título mundial de las 130 libras ante el colombiano Miguel “El Escorpión” Marriaga con un nocaut técnico en el séptimo asalto. “El Staples Center es el lugar perfecto para exhibir a uno de los grandes peleadores del boxeo, Vasiliy Lomachenko, quien se pondrá a prueba contra un competidor destacado en Anthony Crolla de Gran Bretaña,” dijo el legendario promotor de de Top Rank, Bob Arum. “Los fanáticos del boxeo de Los Ángeles son apasionados y bien informados, y espero poder ofrecerles una gran demostración y un gran espectáculo en el Staples Center,” dijo Lomachenko. “Crolla es mi retador obligatorio, y me gusta que siempre viene a pelear. Él va a aprovechar al máximo esta oportunidad.” “No puedo esperar por esta oportunidad. Estas son las peleas por las que estás en el deporte,” dijo Crolla. “La gente dirá que no tengo nada que perder, pero realmente voy a Los Ángeles para sorprender al mundo. Me concentrare en mi. En primer lugar, tengo que asegurarme de que el mejor Anthony Crolla aparezca esa noche. No estoy preocupado por eso. Prepararse para Lomachenko es difícil porque es un poco ortodoxo. Es tan bueno que cuando hace algo mal, se sale con la suya. No enseñarías algunas de las cosas que él hace. Él es tan único en ese sentido.” “Estoy encantado de que Anthony tenga otra oportunidad de ganar un título mundial, esta vez contra la estrella libra por libra, Vasiliy Lomachenko,” dijo Eddie Hearn, Director Ejecutivo de Matchroom Sport. “Después de perder su título mundial ante Jorge Linares, Anthony luchó para regresar a la posición obligatoria y está más que listo para el desafío. Ha sido una historia de cuento de hadas para él y ahora tiene otra gran oportunidad en el gran escenario en una pelea que significa todo para él.” Lomachenko (12-1, 9 KOs) ingresó en las filas profesionales luego de una carrera amateur que incluyó un par de medallas de oro olímpicas para su Ucrania natal y un récord sin precedentes de 396-1. Él estableció un récord de boxeo al ganar títulos mundiales en tres categorías de peso en tan solo 12 peleas, rompiendo la marca anterior de 20 peleas establecida por Jeff Fenech, 30 años atrás. Fue nombrado “Peleador del Año” en el 2017 por la mayoría de los escritores de boxeo después de obligar a sus tres oponentes, Jason Sosa, Marriaga y al también medallista de oro olímpico Guillermo Rigondeaux, a rendirse en sus banquetas. En mayo del 2018, subió de peso y capturó el título peso ligero de la AMB cuando se recuperó de un hombri desgarrado y una caída en el sexto asalto para detener a Jorge Linares en el Madison Square Garden con un golpe al cuerpo en el décimo asalto. Ese diciembre, frente a un todo vendido en el Hulu Theater del Madison Square Garden, anotó un par de caídas y ganó una amplia decisión unánime sobre el campeón de la OMB en el peso ligero José “Sniper” Pedraza para unificar títulos. Crolla (34-6-3, 13 KOs), de Manchester, Inglaterra, se convirtió en profesional en octubre del 2006 y ganó el título de peso ligero británico en el 2011. Ganó el título de peso ligero de la AMB con un nocaut en el quinto asalto sobre Darleys Pérez en noviembre del 2015, tras derribar a Pérez para el conteo con un cruel gancho de izquierda al hígado. Crolla defendió el cinturón con un triunfo por nocaut en el séptimo asalto contra Ismael Barroso, marcando el golpe final en una mano derecha al cuerpo. Perdió el título por decisión unánime competitiva ante Linares en septiembre del 2016, luego perdió la revancha inmediata por decisión unánime en marzo siguiente. Crolla obtuvo otra oportunidad por el título mundial al ser autor de tres victorias de decisión consecutivas, incluida una decisión unánime sobre el ex campeón mundial de peso Ricky Burns en octubre del 2017. Para más información, visite: www.toprank.com, www.espn.com/boxing; Facebook: facebook.com/trboxing; Twitter: twitter.com/trboxing. Utilice el hashtag #LomaCrolla para seguir la conversación en las redes sociales. “Small Town Big Showdown” takes place at the Floresville Event Center on Feb. 23, 2019. Tickets priced $25 General Admission, $80 Ringside and $800 VIP Tables (10 seats) are on sale now and can be purchased by calling (210) 449-5599 or (210) 322-9974. The Floresville Event Center is located at 600 SH 97West, Floresville, TX 78114. Doors open at 6:00 PM, first bell at 7:30 PM. Montreal, Canada – UFC® legend and former two-division champion Georges St-Pierre announced his retirement from mixed martial arts (MMA) today at a press conference in Montreal. Widely considered the greatest welterweight champion of all time, he holds the record for the most 170-pound title defences at nine. During his time at the top of the weight class, St-Pierre earned spectacular victories over Nick Diaz, Carlos Condit, Jake Shields, B.J. Penn (twice) and Josh Koscheck (twice). He also avenged his sole losses to both Matt Hughes and Matt Serra. In November 2017, St-Pierre captured the middleweight championship with a thrilling third-round submission win against Michael Bisping. Born in the small municipality of Saint-Isidore, Quebec, St-Pierre was frequently bullied by older and stronger students throughout his childhood. However, he used this conflict as fuel to dedicate himself to martial arts. After working his way up the ranks through Quebec regional promotion TKO MMA, he debuted on the big stage with a unanimous decision win over Karo Parisyan at UFC 46 in 2004. He won his first welterweight championship via knockout over Matt Hughes at UFC 65 in 2006. After losing the title to Matt Serra, he later recaptured the belt via TKO in their rematch at UFC 83 in Montreal. He then went on to secure nine consecutive defences before stepping away from competition indefinitely. Following a four-year hiatus, St-Pierre returned in November 2017 to defeat Michael Bisping at UFC 217 to become a two-division champion. In 2011 St-Pierre set the largest UFC gate outside the U.S. at $12,075,000 when he headlined UFC 129 at Rogers Centre in Toronto. The event currently holds the second largest attendance in UFC history with 55,724 fans. St-Pierre won Sports Illustrated Fighter of the Year in 2009. He was named Rogers Sportsnet Canadian Athlete of the Year in 2008, 2009 and 2010. He was nominated for best fighter at the ESPY Awards in 2008, 2010, 2011 and 2018. Outside the Octagon®, St-Pierre was featured in films Captain America: The Winter Soldierand Kickboxer: Vengeance. Once-beaten middleweight says he’s ready to graduate from “The Contender” to title contention when he squares off with Jeison Rosario this Saturday on PBC on FS1.